The Navy’s new stealth destroyer endured a real life-and-death test Saturday when crew members helped rescue a Maine fisherman suffering a medical emergency at sea. The Zumwalt, a 600-foot-long guided missile destroyer built at Bath Iron Works, was conducting sea trials early Saturday morning when the U.S. Coast Guard requested assistance from any boats in the vicinity of the fishing vessel Danny Boy, located about 40 nautical miles southeast of Portland at 3 a.m. The captain of the Portland- based Danny Boy, 46-year-old Dale Sparrow, was experiencing chest pains, but a Coast Guard helicopter crew determined it was too dangerous to try to hoist the captain because of the 45-foot boat’s deck configuration. 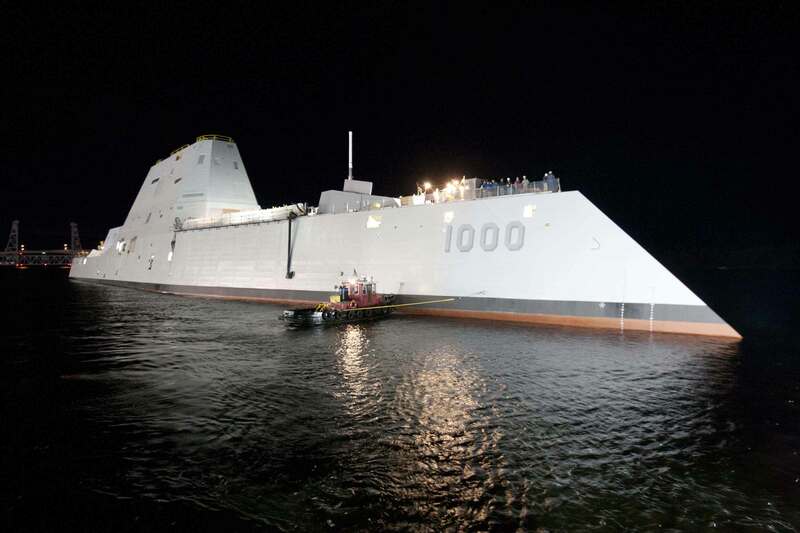 The Zumwalt responded to the scene and launched an 11-meter “rigid hull inflatable boat” – the type used by Navy SEALs and other special forces – to bring Sparrow on board the destroyer. “After medical evaluation, the patient was transferred from Zumwalt to a Coast Guard helicopter and then to an area hospital,” a Navy spokeswoman, Capt. Thurraya Kent, said in a statement Saturday night. The Coast Guard said Sparrow was flown to Portland International Jetport and then taken to Maine Medical Center. Video released Saturday by the Coast Guard showed Sparrow being lifted in a litter from the Zumwalt’s deck to the Coast Guard MH-60 Jayhawk helicopter. The largest and most technologically advanced destroyer ever built for the Navy, the $4.3 billion Zumwalt is undergoing its first round of sea trials in order to test the ship’s hull, mechanical and electrical systems. The unusual-looking ship left Bath on Monday to the cheers and applause of hundreds of people lining the Kennebec River. Officials at BIW, which is owned by General Dynamics, issued a statement praising the ship’s crew. Sparrow’s was listed in stable condition Saturday night at Maine Med. A woman who answered the phone at Danny Boy Fisheries Inc. in North Yarmouth declined to comment Saturday evening. A Portland-based fishing vessel named Danny Boy had to be towed back to Portland by the Coast Guard in September after becoming disabled by engine problems about 50 miles east of Portsmouth, New Hampshire. There were no injuries in that incident.